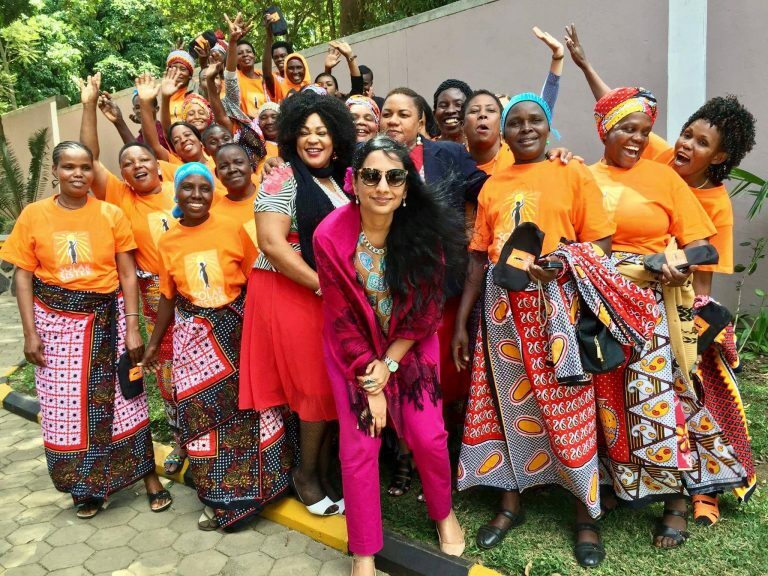 Neha Misra, Fatma Muzo, and Solar Sister entrepreneurs at Entrepreneurs Summit in Arusha, Tanzania. Photo courtesy of Solar Sister. Neha Misra is a social entrepreneur, poet, and visual folk artist with a deep belief in the power of human imagination and action to create new realities. She is the co-founder and chief collaboration officer of Solar Sister and a global champion for improving sustainable energy access by advancing women’s leadership. In 2017, Misra was named a Presidential Leadership Scholar—a historic partnership between the presidential centers of George W. Bush, William J. Clinton, George H.W. Bush, and Lyndon B. Johnson for leaders committed to solving society’s greatest challenges. In 2015, she climbed Mt. Kilimanjaro, the highest mountain in Africa, to raise awareness about Solar Sister’s mission. In light of the Women’s Earth and Climate Action Network’s new Women Speak initiative Ms. spoke with Misra about sustainable energy access, building green economies, technology with a woman’s touch, and more. Could you please start by introducing Solar Sister and explain how you came to be involved with this enterprise? Solar Sister is changing the way that women are recognized, engaged, and included in the efforts to bring sustainable energy access to the world’s hardest to reach, energy poorest communities. An overwhelming majority of the energy poor (over 70 percent) have the face of women and girls for whom darkness is not a figure of speech—it means walking long distances to get kerosene and firewood, missing education opportunities, inhaling deadly air in smoky kitchens, undergoing difficult child births in dismal lighting conditions at night, using dark, unsafe outdoor toilets at the risk of sexual assault; the list is long. Solar Sister is changing this by unlocking women’s entrepreneurship and climate change leadership at an unprecedented scale. We are creating a chain of local, women entrepreneurs who sell and deliver world-class solar lights, phone charging and clean cooking solutions to the doorsteps of their communities across sub-Saharan Africa. An overwhelming majority of the energy poor (over 70 percent) have the face of women and girls. I got involved with Solar Sister in its formative days when serendipity led to a phone conversation with Katherine Lucey—now my collaborator and mentor! We both came from seemingly different backgrounds: I, an Indian energy economist building North-South climate justice bridges in Washington, DC, and Katherine, an American former investment banker from Georgia who had worked on a community solar project in East Africa. We were both looking for ways to build a clean energy movement which places women at the center of the solution, one that changes the narrative of women as victims of darkness to champions of light. Katherine had just registered Solar Sister—in late 2009—and I became the first follower to join her in building this incredible global movement. We were joined by determined women leaders from Africa—Fatma Muzo in Tanzania, Olasimbo Sojinrin in Nigeria, and many others—who joined us hand in hand to build this global Solar Sisterhood. Together, we have grown into a network of 2,800 Solar Sister entrepreneurs who have brought light, hope, and opportunity to close to a million people and inspired many others to replicate our model around the world. Why is it important to empower women in Africa and around the world? Sustainable energy access, women’s rights, and climate resilience are closely tied together. If we want to tackle poverty and bring clean energy to the remotest corners of Africa, we simply have to involve African women and equip them with technology, skills, and confidence to be sustainability pioneers. Each Solar Sister is a testimony that women are essential for democratizing light for all and to bring the lasting behavior change needed to build green economies. In 2016, International Center for Research on Women found that Solar Sister’s unique approach “empowers women, increasing their incomes and making communities safer.” Another study, “Turning on the lights,” by Santa Clara University—based on action research in Tanzania—found that Solar Sister’s trust networks play a key role in bringing the benefits of clean energy to rural communities who experience a positive ripple effect on education, health, productivity, finances, women’s economic, and social empowerment. We are very much dealing with deeply intertwined problems, which have deeply intertwined solutions. The beauty of intersectional activism is that it embraces and challenges inter-locking systems and ideologies. How does Solar Sister know where and when to draw the borders of an organization? We are very much dealing with deeply intertwined problems, which have deeply intertwined solutions. Our goal as an organization is to acknowledge, embrace, and practically address this intersectionality. We have identified where we can make a significant impact given our organization’s vision and unique capabilities. For us, this means applying the missing gender lens to the fundamental way of addressing extreme energy poverty. We are doing this in three ways: directly by advancing women’s leadership from our board room to the villages we reach, by supporting others in adopting our practices, and by advocating and amplifying examples of women who are powering the world and are incredible role models for millions of others. The resulting impact is greater than sum of its parts. Based on your experience, what do women bring to the table when it comes to conversations about energy and technology? Solar Sister’s guiding values encapsulate what women bring to the table when it comes to conversations about energy and technology—Sisterhood, Grit, and Trust. We bring creative collaborations, resilience, and a trust-based approach that humanizes technology. As energy users, educators, and innovators, we bring design inputs that address the practical unmet needs of underserved communities in a manner that benefits all genders. When women act as clean energy leaders in their rural communities, they help reach women, while also gaining economic opportunity for themselves. Solar Sister entrepreneurs invest their savings from kerosene, fuel, and time costs into everything from their children’s education to other business enterprises: Fatuma, Grace K., Mwanaidi, and Grace M. are all a part of a women’s savings group in Mforo village outside of Mwanga, Tanzania. As Solar Sister entrepreneurs, the four women no longer have to worry about covering the cost of home expenses like education, clothes, and food. “If I wasn’t selling solar lanterns, I wouldn’t be able to support my children’s educations,” said Grace K. With the money they make from selling clean energy technology, the Mforo women can put away savings for emergency funds—a sense of economic security for their families they had never been able to attain before. Can you talk a bit about what you call “boomerang” solutions to climate change, and why they are ineffective? By “boomerang” solutions to climate change I mean the misguided approaches which exclusively focus on the biggest, glossiest, sexiest new fads in technology while a) ignoring smaller but tremendously transformative proven solutions—like a solar lantern which can make a big difference to an off-grid rural family that has not had access to electricity b) ignoring the need for patient investment to build local human capacity and resilience without which lasting solutions to climate change are not possible, and c) ignoring the most underserved populations who also happen to be the most vulnerable to climate change—and who are not necessarily the most lucrative if we’re only guided by pure financial return rather than triple bottom line impact of our actions on people, planet, and [redefined] profits. We need to change the bipolar mindsets about solutions to climate change—big or small, urban or rural, equity or efficiency. We need a diversity of solutions. We need to unapologetically care for those who have been left behind from the promises of an electrified interconnected world, and to do so while being stewards of both people and our planet. To progress, first you need light. What do women who have been apart of your social enterprise have to say about Solar Sister? Could you please share an anecdote or two? “I hope a lot for our village for the future. I wish for a school. I wish for a medical clinic … I wanted the community to progress. To progress, first you need light.” Hadija is a farmer, a community teacher and a Solar Sister entrepreneur in Tanzania. Her clean energy business helps her fulfill her dreams for her village. “So I wish every hospital, if they don’t have electricity—they must have solar.” Esupati is a nurse and Solar Sister entrepreneur. Her experiences working in rural Tanzania—where nurses struggle to care for patients after dark—inspired her belief that every hospital should have access to reliable energy. What made you want to be a part of this project and what do you think is the importance of a feminist-led, gender-equalized approach to environmental activism? The Women Speak project represents a global sisterhood of women speaking and acting for climate justice across global, national, and local stages. Solar Sister stands in solidarity with each of these women, and with the Women’s Earth and Climate Action Network (WECAN) and Ms. magazine to add our own voice and move forward with courage and imagination to create a new reality. My thoughts on a feminist-led, gender-equalized approach to environmental activism? I would answer with the wisdom of Alice Walker: “Hard times require furious dancing. Each one of us is a proof.” And we need more of us, now. This post was originally published on Ms. Magazine's blog.